For this new commission, Art at Reading’s Florian Roithmayr has transformed the architecture of Bloomberg SPACE to present an aggregate of his research into material interactions at an unprecedented scale. Roithmayr’s gestural sculptures curl and bend over themselves as if they might envelop the viewer’s body. Poised between raw material and expressive form, these works articulate the tensions between their interior and exterior surfaces. This material precariousness produces inflections as indeterminate as the wordless prefixes that make up the exhibition title – ir re par sur. 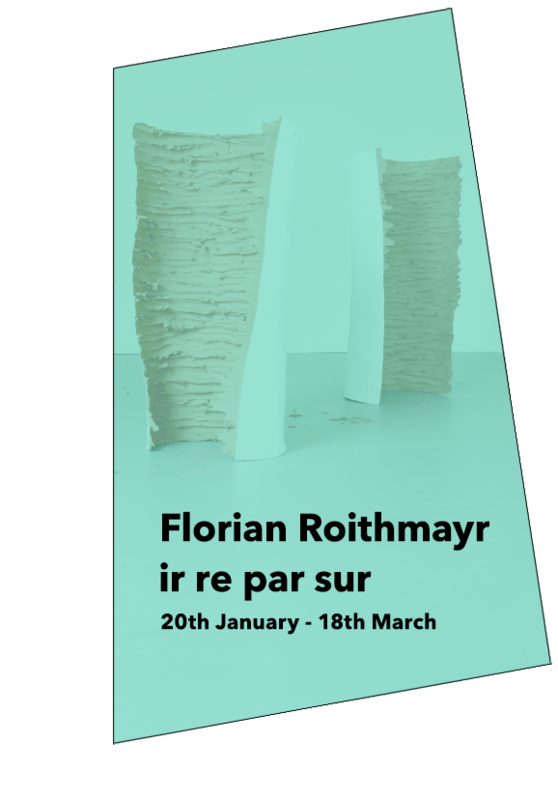 Florian Roithmayr has recently been appointed for the public art commission of the new Chelsea Embankment Foreshore in collaboration with architects Hawkins & Brown, and is currently developing exhibitions with HS Projects in London and a sculpture project co-commissioned by the Museum of Classical Archaeology, Kettle’s Yard, and Wysing Arts Centre in Cambridgeshire. Solo exhibitions include: with, and, or, without, Camden Arts Centre (2015), SERVICE, MOT International Brussels (2015); Matter of Engagement, Site Gallery, Sheffield (2014); Treignac Projet, Treignac, France. Group exhibitions include: Foreign Objects, CCA Derry-Londonderry, Inland Far, Herbert Read Gallery (2016) Things That Tumble Twice, Tenderpixel, London (2015);The Influence of Furniture on Love, Wysing Art Center, Cambridgeshire (2014); Carl Freedman Gallery, Vilma Gold, The Approach, and V22 in London; S1 Artspace, Sheffield; Grazer Kunstverein, Graz; Galeria d’Arte Moderna, Turin; Galerija Miroslav Kraljevich, Zagreb; New Contemporaries and Liverpool Biennial.